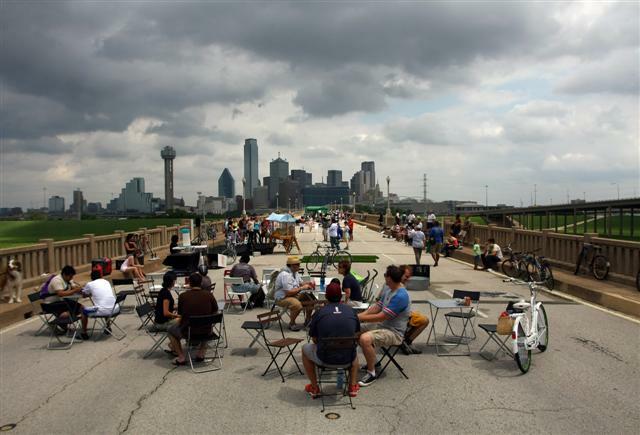 And Now Dallas Has Had a Ciclovia…Will the City Take It On? While the wind whipped up and tried it’s best to wreck havoc on this past weekend’s first annual Ciclovia de Dallas, the people spoke and came out to enjoy a great event on an historic bridge! With no cars to fight against, it was clear sailing the entire mile across the old structure, deemed possibly to be permanently car free once the new streetcar rolls over it’s surface. Overall, we expected about 1,000 people to attend and we feel comfortable saying we hit our mark by the end of the day, and so says the Advocate!. On a shoestring budget, a small and hard working core of volunteers, and shear determination, we were able to pull off the biggest event our small, fledgling organization has accomplished to date! Also, special thank you to Councilpersons, Scott Griggs, Linda Koop, Delia Jasso, Max Kulhammer, and all of the City Staffers who supported this event! Thanks for all the hard work. Had a great time and hope it becomes a permanent fixture. ← What to Know to Attend Ciclovia de Dallas!